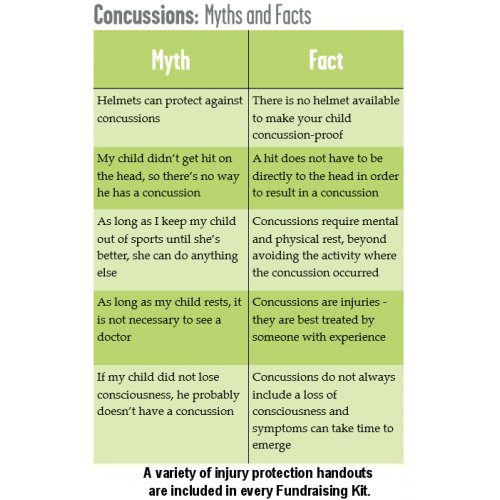 Our children and youth need to be as injury free as possible. 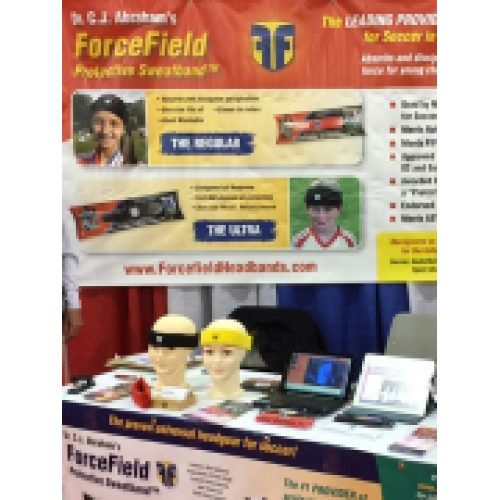 ForceField Protective Headgear™ is not the whole answer, but it will definitely reduce the incidence and severity of head injury in our schools, leagues and clubs. It does not prevent a concussion, it reduces the risk of injury by fusing patented helmet polymers inside an athletic quality sweatband to lessen the force of an impact significantly. Forcefield is listed by the National Federation of High Schools (USA) under safety on their website. Hundreds of thousands are already in use throughout the United States and Europe. Forcefield is #1 in sales and test results among all protective headbands and is the only headband marked CEII, certified for use as protective headgear in non-collision sports. 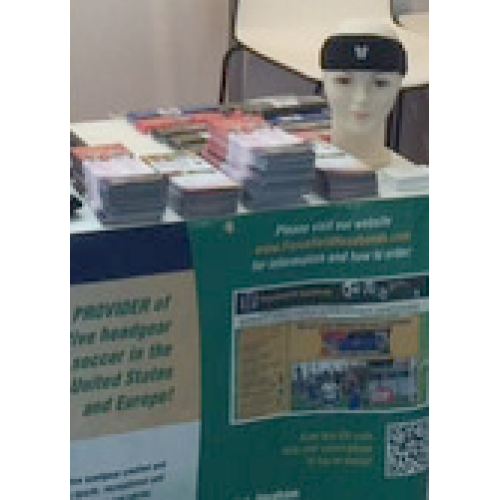 The product looks and wears like a sweatband, is FIFA compliant and ASTM tested. Protecting your head in non-collision sports is now super easy, as easy as wearing a sweatband. You wear ForceField Protective Headgear™ when a helmet is not the best option. When you'd ordinarily wear a sweatband or nothing at all. You want a practical solution to reduce the risk of injury. In case you fall. In case you hit your head. Or when a hit to the head is a normal part of the game. You show everyone you've thought about playing safe. You inspire others to play safe. All students are taught safe techniques and practice until they're second nature. Safety is already top of mind among students. 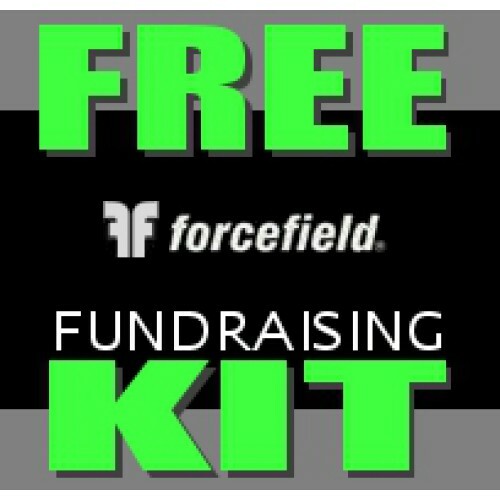 Forcefield presents an opportunity, in it's fundraising kit, to help increase parent and caregiver awareness. Note: Forcefield Protective Headgear™ is not for use in hockey, and not in any collision sport, cycling or any other activity where helmets and protective headgear are already standard equipment. This product is not a replacement for, or protection in place of, proper healing after an injury and does not make it safe to play fearlessly. 3) Reduce the severity of head injuries in activities where wearing a sweatband is practical. To get started, create an account using the Education (fundraiser) customer type at www.playingsafe.ca. Use the Create Account menu found at the top of any web page. Order a fundraising kit from the Intermural menu. Use free shipping coupon code FREESHIP at checkout. DO NOT SEND MONEY; the kit is free. We'll contact you to make kit delivery arrangements. We'll make sure you receive your kit well in advance of your fundraising event. You have plenty of time to put an announcement in the newsletter and send order forms home with students / players. This is a safety reminder campaign to help increase parent and caregiver injury prevention awareness. You also receive a number of ©Parachute pocket concussion recognition tools for distribution to teachers and coaches. This is an excellent way to use Forcefield Protective Headbands as a fundraiser without committing any of your own resources to an event. The funds can be used by the school, you can support your local food bank or you can support another charity of your choice. At the very least, you've reminded parents and caregivers about injury prevention. Hopefully, you've created another opportunity for communication about injury prevention at home. And, you'll earn some money for your fundraising cause along the way. Best of all, it hasn't cost you any money. 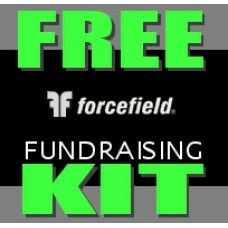 An ideal fundraiser for the student council or a volunteer in the organization, the Forcefield Protective Headgear™ fundraising kit includes a forcefield mascot, a supply of 7 informational handouts including "pocket SCAT3 concussion detection tool", "can't stop the forcefield" game, win-a-free-ULTRA contest and is 100% fun and free to run. The product can be used as a “Playing Safe event”, in addition to your school's Parachute Brain Day or added to other fundraising events. The product e-tails for $29.95 - $34.95 plus tax. A large portion of the revenue from sales, equivalent to the rate a wholesaler would receive, goes to the school or organization to spend on those items at the top of your wish list. Shipping costs are free for the fundraising kit. After the event, shipping is free for the delivery of the headbands, the winning ULTRA and the fundraising earnings. Local sports stores may be selling for more or less. We are able to work with you to make the product most affordable for the students / team and most revenue generating for the school or organization. 2) An envelope to collect order forms and payment complete with master recording sheets stapled to the outside. 4) Name the Forcefield Mascot Contest Entry forms - a draw to win a free Forcefiled ULTRA™. Contest Rules. Use the entry form to draw the face of the mascot then give him/her a name that’s based on a sport or activity where you’d wear Forcefield Protective Headgear™ (like Basketball Bethany). What you need: a Forcefield mascot wearing a Forcefield Protective Sweatband™ (supplied), a small light weight ball (supplied), a supply of balloon prizes in school or team colours or assorted colours (supplied), a supply of envelopes to send home balloons for younger kids (supplied), a blindfold for the older kids (supplied). You supply the spot, the game moderator and the participants. Setup: You place a piece of tape on the floor a distance away from the table (the line). Place the Mascot on the table. Have a Gym Teacher, Coach or the Principal vet the location for the game. It needs to be in a low traffic area and the area between the player and the Mascot and the (ricochet trajectory) area around the Mascot needs to be clear at all times. The participant is handed the Styrofoam ball and asked to stand behind the line. The participant tosses the ball at the Forcefield Mascot wearing the headband trying to hit the headband. If the ball hits the headband, it's a win. If the ball misses the headband, it’s the next person’s turn. Winners may pick the balloon colour and shape of their choice. The game moderator seals the winner's balloon in an evelope to take home (younger children). Older participants may play the game blindfolded. The game is over when you run out of participants or balloons. 6) A supply of some or all of the following handouts, Copyright © Parachute 2017. Sport safety tip sheets for preventing injuries in the following activities: soccer, skiing and snowboarding, skateboarding, in-line skating, ice skating, baseball, tobogganing, camping and hiking. You may make additional copies of concussion materials royalty-free as long as you respect the Parachute copyright and do not alter the materials. Parachute is a relatively new, national charitable organization who's mandate is to prevent injuries and save lives. Parachute is Health Canada's arm in concussion education. Parachute is the amalgamation of four, 20 year old organizations: ThinkFirst Canada, Safe Communities Canada, Safe Kids Canada and Smart Risk. Headbands, fundraising dollars and winning contest Forcefield ULTRA™ will be delivered 30-45 days from the time you send us your order forms. We recommend as soon as possible after the Playing Safe event day. Fundraising organizations are responsible for 1) distributing the headbands to the correct receipients 2) announcing the winner of the Forcefield ULTRA™ on the announcements and in the newsletter and 3) putting the fundraising dollars earned to good use.